We’ve got the patterns for the second set of Book Club stitchettes up in the shop today. 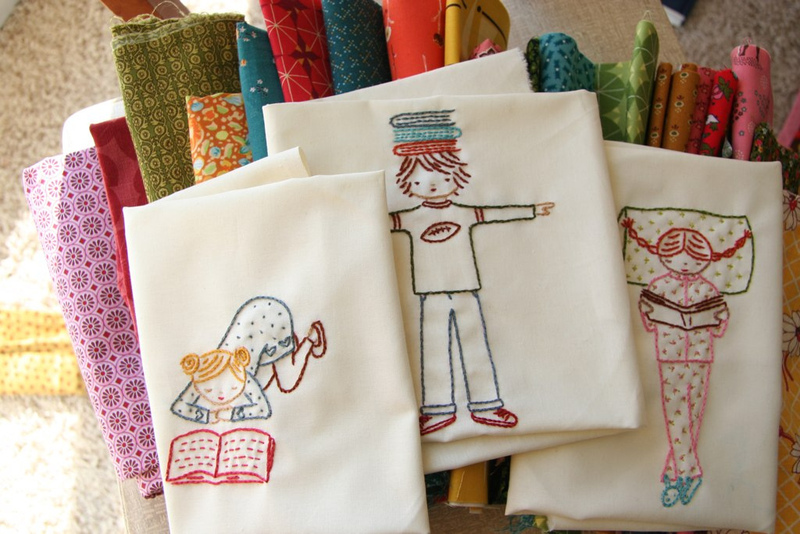 So the plan — there’s always a plan — is to make 9 designs in all and do sew them altogether in a cool quilt for the kids. I’ve done 2 sets and was thinking we’d do this, if you’ve bought both sets, the third will be free. I’ll also be writing up the directions for the quilt and have those available in the freebies section for anyone interested. I think it’s going to be really cute. I have two quilt ideas that I really want to get made up while we’re snowed in. Oscar’s on board with the hibernation mentality. Now if I can just get Phoebe to calm down and play quietly I’ll be good to go! These run-around kids don’t do so well in the Winter, do they? And this week’s super lazy blogger could google it but is just asking friends question is.. what’s the coolest biggest Blythe community? I feel like playing Blythe again. Too Cute!!! Just bought this one as well ;-). What a lovely and generous thing to do, to give the 3rd upcoming set as a gift for those (like me..he he) that have purchased the first two sets!!! yep, curly! I’m on it! How funny! I was just about to post that my friend started a Blythe group that I think will be right up your alley and there it is above. I love the book club series. I think they would make a terrific set of pillows for a reading room. Of course, for me a reading room is any room I’m in, so I would need to definitely make 9! I’ve just made my 1st purchase from your shop…both Book Club Stitchettes, and can’t wait for more. You’ve inspired me! I’ve been in a crafting funk for a while now, but reading your blog has got me picking up & finishing old projects and planning new! Thank you so much. So hard to know where to start; please do let us know your favorite finds. (Vintage jewelry & Blythe stockings for the girls for Valentine’s Day–red & orange argyle and pink & white stripey). We homeschool, and I absolutely MUST stitch those for our homeschool room. Fit us to a tee!!! Can’t wait to see what you have in mind for the quilt too. Thanks to my fabric habit, I can’t afford an authentic Blythe, so I bought myself a Littlest Petshop Blythe. She sits in my sewing studio and I’m just nuts about her. It’s the little things…..hee hee.